Rynex 0.05% Nasal Drop: Each ml contains 0.05 mg of Oxymetazoline Hydrochloride BP. 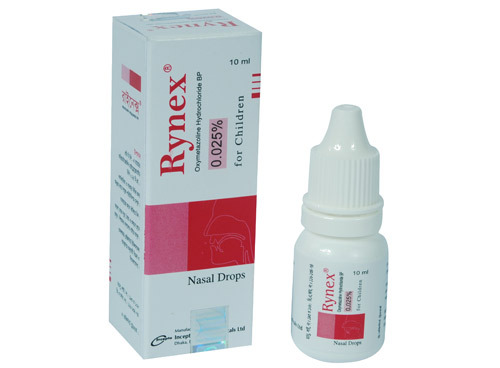 Rynex 0.025% Nasal Drop (For Children): Each ml contains 0.025 mg of Oxymetazoline Hydrochloride BP. 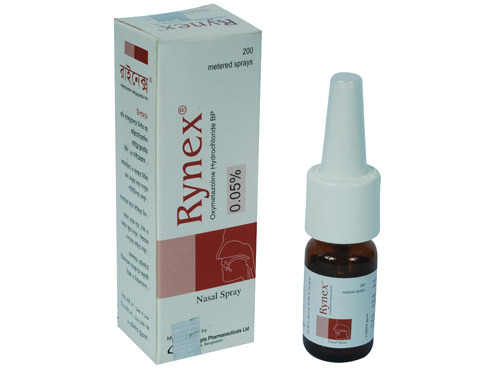 Rynex Nasal Spray: Each actuation delivers Oxymetazoline Hydrochloride BP 25 mcg. Oxymetazoline Hydrochloride is an imidazoline derivative sympathomimetic amine. It directly stimulates alpha adrenergic receptors of the sympathetic nervous system. Intranasal application of oxymetazoline results in constriction of dilated arterioles and reduction in nasal blood flow and congestion. Oxymetazoline Hydrochloride is applied topically to relieve nasal congestion associated with acute or chronic rhinitis, common cold, sinusitis, and hay fever or other allergies. It is also used as nasal decongestant in otitis media. Adults and children 6 yrs of age and older : 2-3 drops or sprays in each nostril twice daily for 3-5 days. Children of age 2-6 : 2-3 drops in each nostril twice daily for 3-5 days. Sprays are generally unsuitable for young children because of the small size of their nostrils. The drug is not recommended in children under the age of 2. * Transient burning, dryness of the nasal mucosa, sneezing. * Hypertension, palpitation or reflex bradycardia. * Prolonged use may result in rebound congestion. * hypertension, cardiovascular disease or hyperthyroidism or in those receiving MAO inhibitors. Pregnancy : Safe use of oxymetazoline during pregnancy has not been established; it should be avoided by pregnant women. Nursing Mother : It is not known whether oxymetazoline is secreted in human breast milk; caution is advised.